Mullery auctioneers has just brought to the market a stunning owner occupied detached residence situated in Ros Ard on the Cappagh Road. Number 40 has been lovingly cared for by the current owners and is tastefully presented with a quality finish evident throughout. This fine home boasts an inviting entrance hall with porcelain tiled floor and carpeted staircase leading to the first floor. There is a guest wc off the hall. The living room, situated to the front of the house, is a well-proportioned room with feature fireplace, wooden floor, and bay window. Double doors lead through to the adjacent kitchen/dining room. This bright and spacious room is fitted with a superb range of units including an island unit. There are granite work surfaces and a range of integrated appliances. A patio door leads from the dining area to a beautiful private rear garden. Off the kitchen is a utility room. Also on the ground floor, there is a family room/playroom. Moving upstairs, there are four bedrooms, all of which have fitted wardrobes. The master bedroom has an en suite shower room and there is also a well-appointed main bathroom. Moving upstairs again to the attic is a wonderfully bright and spacious attic room/hobby room with varnished wooden floors and eaves storage space. The property benefits from oil fired central heating with upgraded boiler, alarm, built-in wardrobes to the bedrooms, an open fireplace, and oak internal doors on the ground floor. Outside to the rear is a beautiful landscaped garden with manicured lawn, patio, and a variety of mature trees, shrubs, and hedging. There is also a shed for bikes and gardening equipment. To the front is a driveway, lawn, and a variety of shrubs. 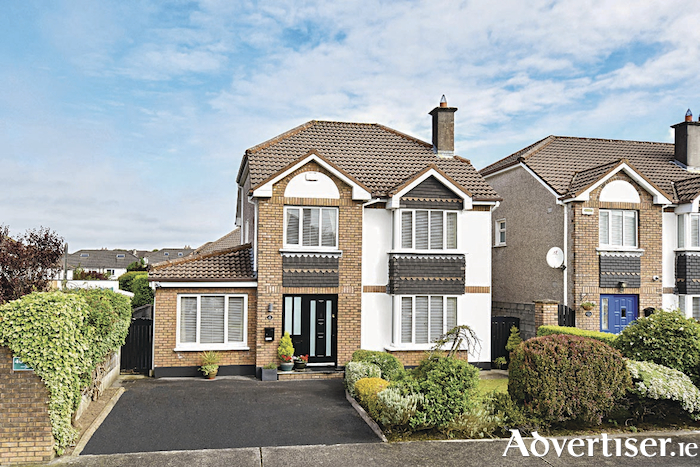 Ros Ard is a beautifully maintained development situated on the Cappagh Road and conveniently located close to local amenities including shops, primary and secondary school, public transport, church, and leisure facilities at Cappagh Park and Barna Woods. Number 40 is a superb home that will not fail to impress any discerning buyer. Viewing is highly recommended. Full details are available on www.mulleryauctioneers.ie or call Mike Mullery on 091 567275 or 087 6424106.